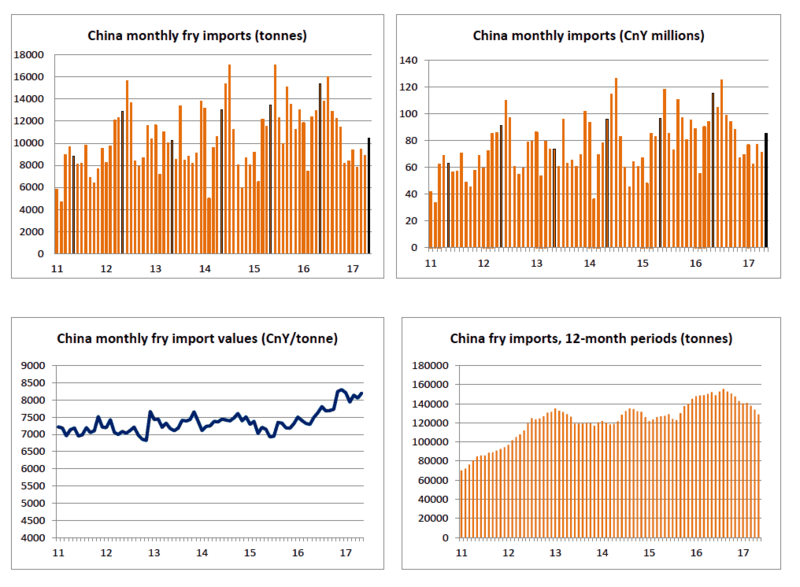 China’s fry imports in May were down nearly a third compared to the same month in 2016, with the US and Canada seeing the biggest declines in demand. During the month 10,427 tonnes of product were imported, with annual imports down 15.3% to 128 927 tonnes. The price of imports in May was up 9.4% to CnY8 199/tonne. The current exchange rate is US$1:CnY6.84 and €1:CnY7.65. US fry imports were down 33% to 7,178 tonnes, which was 68.9% of the overall total, which compares to 69.6% of the total in May 2016. Annual US imports were down 19.0% to 87,638 tonnes. The average price of US imports was CnY8 904/tonne in May, up 15.0% on May 2016. Aside from New Zealand, where there were minimal imports, the US price is the highest of all the main suppliers at 8.6% higher than the average and 57.4% higher than the German price. Belgium has overtaken Canada as the second largest supplier to the Chinese market in the last year, but that is because of reduced Canadian imports, rather than increased Belgian ones. In May, Belgian fry imports were at 976 tonnes, down 2.9% and down 2.2% over the year to 14,961 tonnes. Canadian imports were at just 671 tonnes in May, down 75.6% on the same month last year. Annual imports have halved to 9,914 tonnes, with the average price of Canadian imports was up 10.3% to CnY7 274/tonne. Turkey continues to increase its sales in the Chinese market. In May it was the third largest importer of fries at 772 tonnes, which was up 181.8% on the May 2016 figure, with annual imports at 8 850 tonnes, up 1 929%. The increase in sales has taken place despite Turkey being the second most expensive supplier after the US. Elsewhere, Dutch imports more than doubled in May to 560 tonnes, but were down marginally over the year to 3,857 tonnes. German imports have fallen by nearly 40% in the last year to 1,487 tonnes, while New Zealand imports almost double over the year to 1,219 tonne, but were virtually non-existent in May.